This entry is the first in a series by London-based filmmaker Tree Carr. We spend a big part of our life asleep and dreaming. If the average night’s sleep is eight hours (ie: one-third of a day), one sleeps for one-third of one’s life. If you live, say, 75 years, that’s 25 years asleep! That is 25 years in which to explore your dream worlds and subconscious mind. A lot can get done whilst you sleep. For as long as I can remember, I have always been fascinated by dreaming. My persistent experiences with sleep paralysis and lucid dreaming have had profound effects on me which have led to a lifetime of exploration into the meaning of dreams. Some of my earliest childhood memories were of dreams that I had – as early as three years old I can recall dreams about flying, falling down from outer space, the natural world, far off lands and recurring dreams of soldiers, cowboys, Jesus Christ, giant robots, the moon, the ocean, angels, natural disasters and the end of the word. As a teenager I began recording my dreams in a dream journal. This helped me to process, interpret and analyze my subconscious mind and become familiar with my shadow self. Dream journaling was the beginning of the gradual evolution of my dream world into the exploration of lucid dreaming, healing dreams, dream symbols, precognitive dreams, wet dreams, compensatory dreams, mutual dreams, after death visitation dreams and O.B.E’s. I look to my dreams for many different things: soul growth, healing, creative inspiration, guidance, adventure, pleasure, problem solving and helping others. I woke up in a paralysed state. The room was in that grey other dimension colour. I looked at the ceiling and it was like a giant grid with multiple pages with graphite writing and images. They were flipping and turning revealing different images. 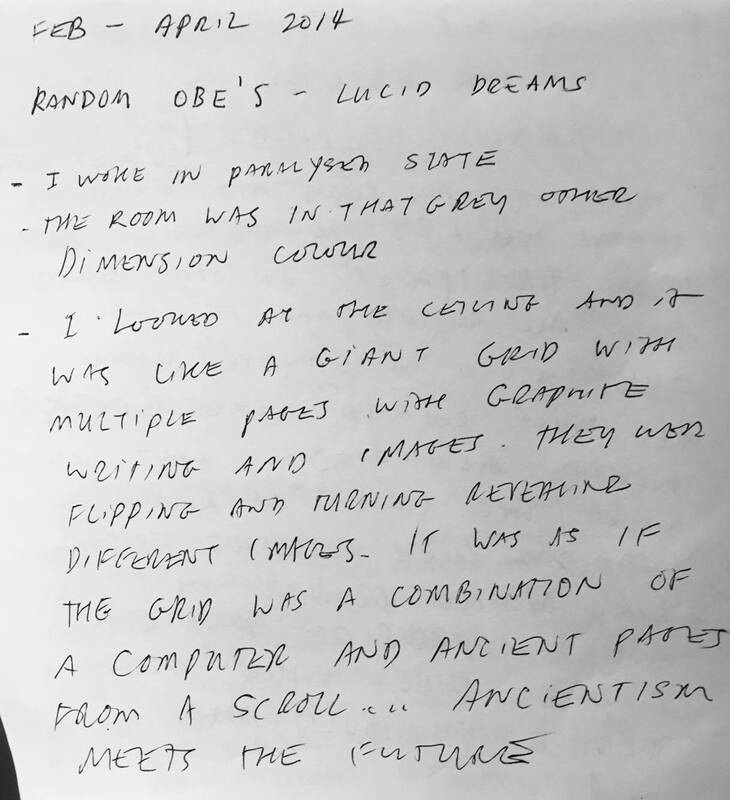 It was as if the grid was a combination of a computer and ancient pages from a scroll. Ancientism meets the future. I then left my body and floated to the ceiling to get a better look. The ‘pages’ on the grid were all moving and flipping quickly. 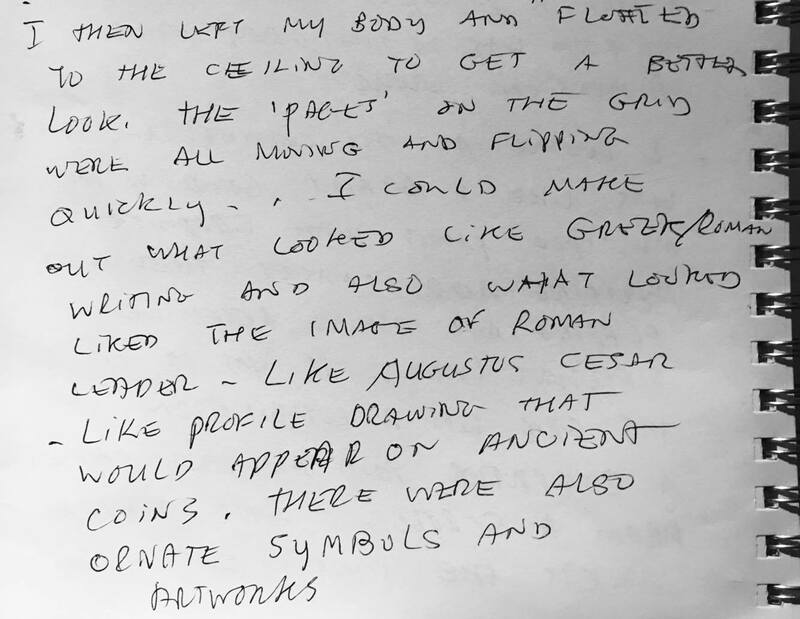 I could make out what looked like Greek/Roman writing and also what looked like the image of a Roman leader, like Augustus or Caesar, like the profile drawing that would appear on ancient coins. There were also ornate symbols and artworks. 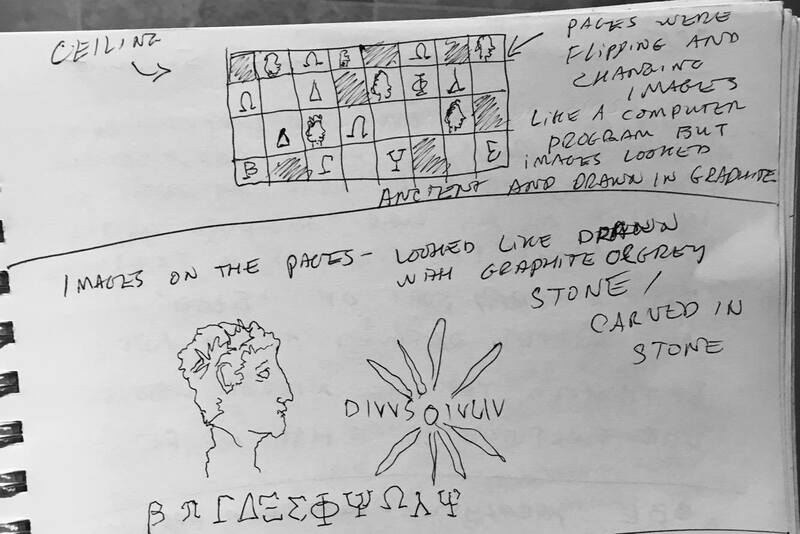 Images on the pages looked like drawn with graphite or grey stone – carved in stone. Reflections: I was amazed by the detail and intricate nature of the images that I was seeing in this dream. It felt quite mystical and mysterious. None of the imagery or themes pertained to my waking life in any way. I am not studying Greek or Roman History nor have I been reading about this time in history or seeking it out in any way. It was a bit of an, ‘out of the blue’ theme. Has anyone seen this theme in their dreams before? Does anyone keep a dream journal? I’d love to hear your thoughts or of any similar experiences! Tree Carr is a London-based filmmaker, musician and lucid dreamer. She looks to her dreams for creative inspiration, self exploration, healing and the personal expansion of greater consciousness. 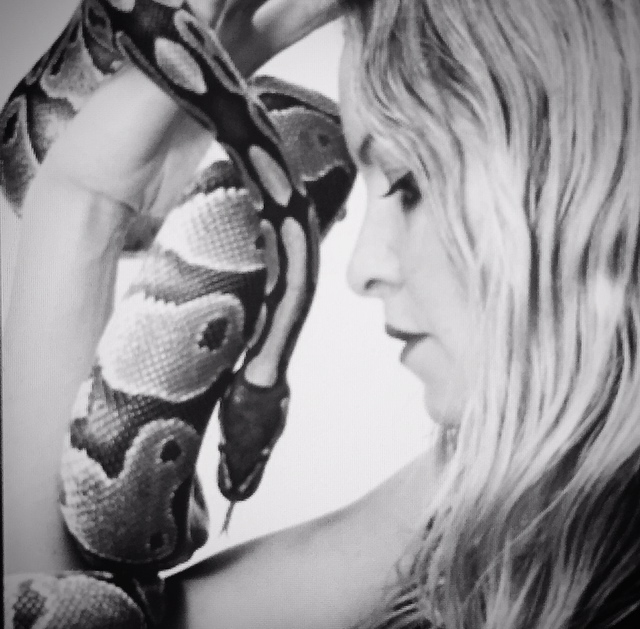 She’s been journaling her lucid dreams, sleep paralysis and O.B.Es for over 20 years. Hi Tree, I’m aware of your dream workshop today in Brighton (where I live), & I’ve just had a first look at your website. My sleep & dreamtime are very important to me, & I believe that I do a lot of spiritual work, emotional processing & connecting with the higher realms in my dreams. I have been consciously (deliberately) doing dreamwork for the last 24 years, but I had a rich & varied dream life before that too.